80% of luxury brands sale are now being influenced by digital marketing clearly highlights the important role digital marketing now plays within a luxury. 26 Jan Does digital marketing make sense for Luxury Brands? In recent research on digital marketing trends on Luxury brands by McKinsey reported that 80% of luxury sales are now influenced by online. 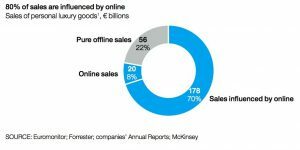 This is a staggering figure, and clearly highlights the important role digital marketing now plays within a luxury purchase. One point of caution here is that the digital revenue at the majority of luxury brands still contributes little in comparison to other sales channels. 2018 may have been a challenging year for luxury and overall retail sector, but there were a few luxury brands who certainly knew how to invest their marketing dollars despite the challenges. My article is my attempt to highlight key digital campaigns and activation’s done by Luxury brands. So what makes a digital campaign or activation successful? Experiential marketing that taps into the desires of its consumers, not only by gadgets or tech stuff but by instilling a deep sense of belief in consumer’s mind as to what your core brand purpose and for what it stands for. This forms the basic premise for any Brand Positioning. The brand core purpose is “to adorn the necks of every woman around the world with pearls”. That was the vision of founder, Kokichi Mikimoto. Mikimoto, the over 100-year-old Japanese jewelry brand, launched their digital campaign, featuring seven self-made women, each offering their “pearls of wisdom” on their accomplishments, achievements and life experiences. This luxury brand knows how to keep up with the times while maintaining high standards for quality. Staying current yet defending their classic aesthetic is what led to the creation of “Timeless”. A film in which a young man chases a woman throughout a train. As the train moves, and the two individuals run from carriage to carriage, their outfits and hair change, as they travel through time, jumping from decade to decade, representing the timelessness of the Lacoste style. The brand ran the video snippets on Instagram stories. So what is making luxury brands successful in their digital activation’s? One common thread in these brands using digital marketing i.e. While image and text-based content are effective, video content can be far more so when it comes to generating engagement on social. Limited use of social platforms. Chanel posts consistently on YouTube in particular, using the platform for narrative-led, feature film content. Its first – ‘The One That I Want’ starring Gisele Bundchen has amassed over 18 million views to date. Alongside celebrity-driven campaigns, the brand also uses video for more behind-the-scenes content, such as its ‘Inside Chanel’ series, which is designed to remind consumers of the brand’s long history and unique vision. 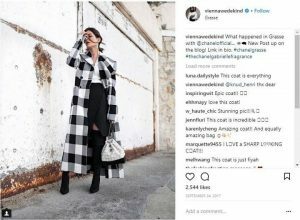 Just because luxury brands are embracing social media doesn’t mean they have to become mass-market. Chanel is a great example of how to retain a sense of exclusivity, as well as how to capitalize on it to make users feel important and valued. When marketing luxury products, photographs & videos are one of the best mediums for evoking the aspirational emotions that we connect with driving a luxury vehicle, wearing designer clothing, or experiencing something exclusive. Visual social networks like Pinterest, Instagram stories, FB Live represent a huge opportunity for luxury brands to raise brand awareness and advocacy. I would be writing another article on “why people buy luxury” shortly as a part of my luxury brand initiative. Ritesh Mohan is a passionate retail professional with over 20 years in the Retail sector, handling some of the biggest brands in beauty, fashion and fragrances retail & FMCG sector. Has been instrumental in the growth of some of the regional brands as well in the Middle East region. He specializes in Retail management, Product development, and Brand Management, Retail Operations, Sales Management, and Franchising & Business Management. He strongly believes in empowering business owners with his wisdom & experience of around two decades in the industry.